Patterns evolve to fit a given area, accommodating the individual workers proportioning and working tension. The following patterns try to present an idea as to how this has come about over the years. The patterns with eight pyramids interspersed with the foundation bars provide a never-ending permutation of adaptations depending on the position of the circle from which they radiate. 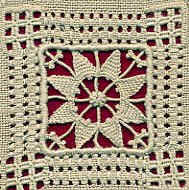 The general rule being a circle placed at the halfway position of the shortest square bar and that radius maintained to full circle, the number of buttonhole stitches placed comfortably in a section, there is a good chance that the same number of rows will arrive or just fall short of the padded roll where it can be attached. Depending very much on the stitch tension of the individual worker. Left- this pattern is approx. 1½" or 4cm, on this scale there is little need for much else. 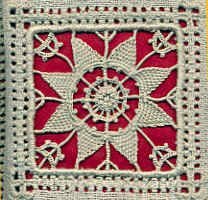 Bullion Knots are a familiar feature in Ruskin Lace, they cover the centre junction of the foundation bars and create a focal point, and it is within the interest of the worker not to allow this centre junction to become compacted as the foundation bars are worked. The row of buttonhole stitch into the in between spaces of the base row on the pyramid as a complete circle with a picot to add texture is suffice. Corner units are necessary to maintain the right angle of the square adding decorative strength to the end result. No matter how small this is it will serve the purpose, often breaking up space detracts from the aesthetic quality. Right- here the scale is larger, approx. 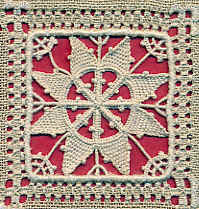 2¼" or 6cm. Though the pyramid circle was placed at the same proportion, as the sections for the pyramids are larger automatically a larger number of stitches are needed, in turn providing the same number of rows. The inner space is greater and will accommodate a double circle unit to maintain the web, which without this support would be weak and wobbly, a quarter of this unit is repeated in the corners. Left- very similar to right above, except for change of centre, this one gives more definition, so lends itself to viewing from a distance, as in a lampshade or picture sampler hung on a wall. Right- begins to illustrate what happens when the pyramid circle is a reduced halfway radius. A less number of stitches fits in the section, resulting in a less number of rows, therefore not reaching the padded roll without causing distortion of the pyramid circle. If the distance to reach is less than ⅛" or 3mm then a one thread bar will suffice to attach the pyramid to the padded roll and look like an extension to the pyramid, otherwise lay three threads and whip stitch back to the end one stitch of the pyramid, then completing it in the usual way. As there is a proportionally reduced centre area, a picot cluster has been worked which did not quite look enough so a circle of buttonhole stitch, one thread bar and picot has been worked quite close connecting to the picot cluster to produce a pleasing balance without clutter.